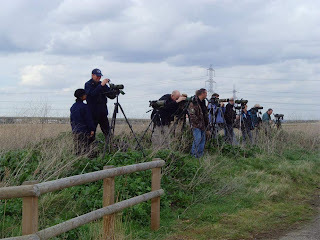 Highs and Lows of Birding: Stonker saves the Weekend, another game set and match to Essex! Stonker saves the Weekend, another game set and match to Essex! The weekend was reasonably quiet for me in North Kent,despite a few short visits out to look for migrants. I had a walk in the fields and adjacent woods to Camer Park, near Meopham where a Swallow quickly zipped past in a rain storm, 'sign of summer and Wimbledon', a superb group of seven Brambling with some cracking males plus a Sparrowhawk overhead and a Chiffchaff singing were the best I could manage. 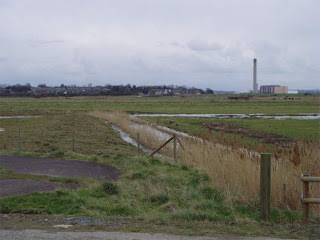 Sunday I visited Cliffe RSPB and had a look on the Thames where the best bird was a Short-eared Owl showing distantly quartering the river wall, ................. in Essex at Coalhouse Fort. A Wheatear was near Coastguards and a Little Gull plus two very vocal Med Gulls on the quarries but despite much searching Iceland Gull scored zero. 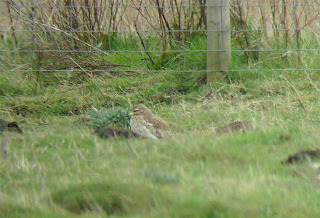 I was at home briefly before a timely email indicated a Stone Curlew at Rainham RSPB in Essex, a mere 20 minutes away. I paid my dues at the Dartford traffic pollution jam, as all the vehicles slow down before acceleerating again and called in at Rainham. After a brisk walk the bird was nailed and photoshop had it's work cut out with the photos I took!!! is there a competition for the worst bird photo? 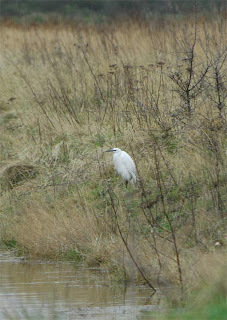 Also at Rainham a few Little Egrets and a good crowd of Stonker watchers!! Incredibly it's the third bird I've seen in this area with two on the Dartford side of the river.